Not long ago, herbs grew in every garden and were sold by every greengrocer, but all we seem to use today is parsley as a garnish. Whatever happened to fresh chives, tarragon, basil and sage? We used to know that herbs were natural flavour secrets that would give a lift to the simplest budget dish or the most complex gourmet creation. Perhaps we have forgotten because we have become accustomed to dried herbs whose flavours and fragrances have been destroyed by processing. One of the real joys of hydroponics is the rediscovery of fresh kitchen herbs. Once you have used them, you'll never want to be without them again. 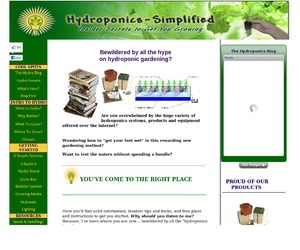 Finally, it is worth remembering that for most people hydroponics is a new and exciting science. There is still much to be learned. Don't be afraid to experiment, particularly if you find that something in this or any other book is unsuitable for you. What works for me may not work for you, and what I believe may not hold true in your particular case. What this book seeks is results for you, and the proof of any system or method is what it produces. Hydroponic Systems: To Buy or Build? Many people who enjoy working with their hands, making things, gain tremendous satisfaction from what they create and deplore spending money on a manufactured product. To these people, I say study the diagrams given here and enjoy yourselves. There are at least as many others, however, who would rather concentrate on the actual growing of hydroponic plants and who would prefer to buy a system that they know will work. One of the wonderful aspects of hydroponics is that there are no limits to the inventiveness of the builder or even the buyer of a system. Try anything that you think will work. If it doesn't, you can always alter your procedure, and you will have gained valuable information in the process. Even the most knowledgeable user is constantly trying new methods, different nutrients, many varieties of plant life and wide ranging applications of all the necessary components of hydroponics. If there is a single word that sums up the best approach to hydroponics, it is experimentation. If you decide to build your own system, remember that hydroponics is more a science than an art. 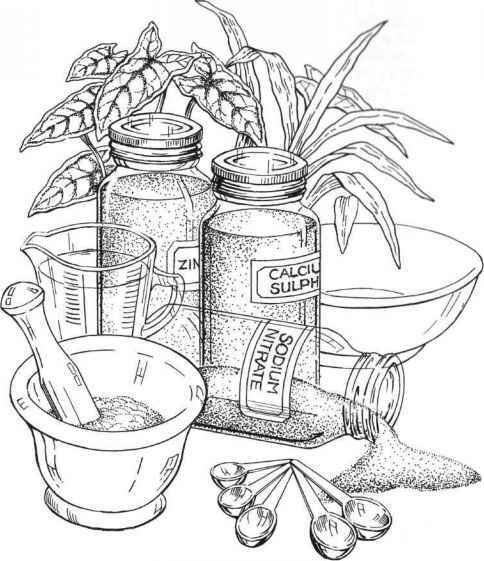 To get satisfactory results from a homemade system, much more is required than a box to hold plant life. Growing hydroponically in a greenhouse. The more you substitute for nature, the more complicated these methods become. When plants are removed from their natural environment, as in indoor gardening, then all aspects of that environment have to be duplicated by artificial or technical means. The important thing to recognize in any of these methods is what is taken away and what needs to be replaced. There is no substitute for natural sunlight, for instance, although there are adequate replacements. This is why I recommend that your year-round garden be portable so that it can be moved outside in summer. Chapter 3 deals extensively with nutrients, because when growing hydroponically this is the most obvious part of the environment we are removing. Should you decide to confine your growing only to the outdoors, then you needn't know a great deal about lighting, temperature and humidity controls, pollination, or any other scientific matters other than nutrients. However, the remaining three approaches do require a working knowledge of all these things. Simply put, pay attention to the environment around your crop, or you won't have a crop. For example, I have received hundreds of letters and phone calls from people saying that they had numerous flowers on their vines indoors, but that the flowers died and fell off before any fruit formed. Their answers to a few questions told me that they knew nothing about pollination or cross-pollination. These are simple tasks that wind and insects usually do, but when the plants are moved indoors, the individual must take over. There is no reason to be intimidated by pollination and other rather scientific terms; the procedures are simple, and they are covered fully in Chapter 10. The point is that you do have to know how. Hydroponics is a science and there is a considerable amount of knowledge that must be acquired. For these reasons, I usually suggest a manufactured system to the novice who chooses to grow a year-round garden or indoors exclusively. The reason is simple: if you start growing hydroponically with a system that is only partially effective, when you start having problems it is more difficult to ascertain whether the trouble is with the system, the quality of nutrient or the environment. You know a manufactured system works, and any problems you encounter will be environmental. You can therefore concentrate your learning in the area of the plants' requirements. 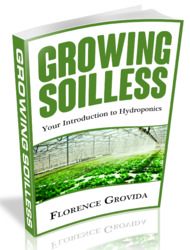 The person who spends thirty dollars making a simple hydroponic system may discover that seven days a week, three times a day, he or she must be available to pour nutrient over the aggregate. For the busy city-dweller, this could be a hassle. He or she could have purchased a workable system, experimented a little, gained biological knowledge, got the "feel" of hydroponics and been ready to branch out to build a system suited to the individual's needs. 1 don't mean to downgrade the homebuilt system, as the following diagrams and plans show. These remarks are meant as cautions only, because there is nothing more unfortunate than losing an enthusiastic novice due to problems that might have been solved by starting with a manufactured system. Unfortunately, the recession of 1982 drove out of business many companies that were selling and/or manufacturing hydroponic systems. The resource list has been updated with regional suppliers. Check your local Yellow Pages for other suppliers in your area. Those fortunate enough to locate a local supplier will still be able to make a choice. Those without a choice will simply have to build. In order to facilitate this, I have further explained the patented irrigation method of my City Green system in Figure 8. When building your own system, keep in mind that there are really only two things you are trying to accomplish. The first is a structure that permits support for the root system, and the second is a method of supplying nutrient and aeration to your plants. Every system must begin by satisfying these two requirements. After these requirements are met what we try to achieve is a more sophisticated and automatic method. For the simplest systems, all you need is a waterproof container filled with some kind of growing medium or aggregate for root support. Into the aggregate you place seeds or young plants whose roots have been washed of soil. Then you pour a nutrient solution over the aggregate to feed the plants. This is hydroponics! This simple system is not essentially different from the one used in the Hanging Gardens of Babylon, and in its operation we find that several problems arise. It is these problems and the solutions to them that have resulted in the development of more sophisticated automated systems. The first problem concerns just how much nutrient to pour over the aggregate. Assuming that the container is waterproof and that the inside bottom of it can't be seen through the walls or down through the aggregate, it is very difficult to gauge the amount or level of nutrient solution. Without this information, it is quite likely that the plants will be killed by either under or overfilling. The only simple solution to this problem is the use of a see-through container, a transparent inspection window or a float system that will allow a visual check of the nutrient level. Otherwise, you must employ a semi or fully automatic system. The second problem is how often to pour nutrient over the aggregate. Should you decide to "water" your plants hydroponically as you de your house plants, once or twice a week say, you would probably kill everything. Given similar evaporation rates, the nutrient solution will evaporate from the loose aggregate much more quickly than water from soil. Generally speaking, you would have to supply nutrient to your plants about once a day. This would mean you couldn't even go away for a weekend or your hydroponic plants would begin to suffer. The more simple the system, the more frequently someone will have to be available to add nutrient solution. Anywhere from one to four times a day will be necessary depending on light, temperature, humidity, what is being grown, how large your plants are and the size of your container. A third problem involves proper aeration for the roots. In soil, worms usually perform this function, except, of course, for house plants. One of the major reasons for using hydroponic aggregate is to permit aeration. AGGREGATES Aggregates come in many forms: small rounded stones, broken tiles, crushed stone, perlite, slate chips, vermiculite, expanded oil shale and lava stones. Because the growing medium must perform the two functions of support and aeration, the lighter and more porous it is, the better. Actually, almost anything can be used as an aggregate, but the builders and owners of home systems are more limited than commercial growers in the kinds of materials that they can use. Perlite is a bit light, floats somewhat and builds up heat, so it is not as good as some other materials. Vermiculite holds considerable moisture and this can be a real problem for your plants under certain conditions. Broken tiles or pottery can have sharp edges that might damage root systems. Crushed stones or gravel will likely lack porosity and could have lime bases which would be detrimental to your pH level (see Chapter 4). Of all these materials, haydite seems to me to be preferable. It is an expanded oil shale that has been processed for agricultural purposes. Like lava stones, it has the advantage of being extremely porous for aeration, while at the same time it is capable of holding satisfactory quantities of water. If not processed, both materials must be washed repeatedly in a bucket until the water runs clear to remove accumulated dust and dirt. Processed haydite is not available in all areas, so you will probably end up using a locally available material or ordering haydite from one of the suppliers listed at the back of this book. In certain locations, haydite may be sold under other names, such as herculite, and it is worth checking with a dealer to find this out. The one drawback of haydite is that it is heavy and consequently expensive to ship. If you use gravel, broken tiles or haydite, try to keep the pieces no larger than about three-eighths of an inch. Smaller pieces will not give sufficient aeration, larger pieces will hold insufficient moisture. The strength of nutrient solution used and the frequency with which it is applied are both important, as we have seen, but adequate drainage is absolutely essential. Plant roots can only remain submerged in the nutrient solution for a few hours without air before they begin to suffer. 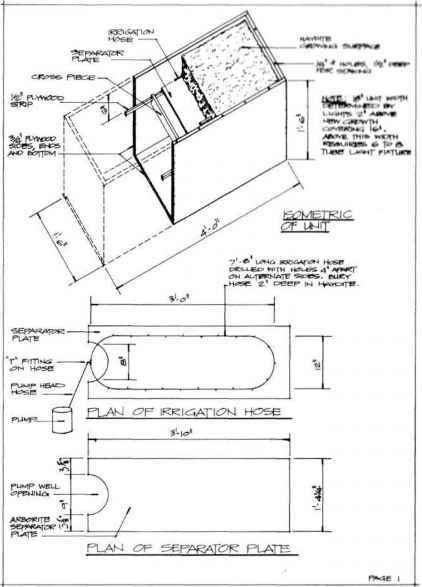 In the simplest systems, drainage may be achieved by simply pouring off the solution or drilling small, strategically placed holes in the container to allow run-off. Such drainage methods, however, require considerable attention and experimentation, and the more we become involved in hydroponics, the more we look for methods of feeding that are less time-consuming. Constant flow: see figure 8. I prefer the third method, because the root system is constantly and gently sprayed with nutrient solution and drainage is almost immediate. The simplest mechanical means of achieving constant flow is by using either an air pump or a small submersible water pump that draws from a reservoir. The drip from the above method does work; however, the growing medium will have a very moist surface, which will result in algae buildup that not only lacks aesthetic appeal, but also can slow down plant growth. The algae will overgrow the aggregate and reduce aeration. It will also probably use up considerable nutrient. The problem of drain* age still has to be solved for this method. Flood and drain works as well, but it, too, can suffer from an algae problem, and I suspect that it may be a bit of a shock for the roots to be suddenly immersed in nutrient two or three times a day. Perhaps more significantly, it is much more difficult to seed directly into this system than into a constant flow arrangement, since the onrush of solution can float seeds or even seedlings to the surface and then wash them too far below the surface as the level recedes. Whatever system you use in your homemade hydroponic garden, full consideration must be given to drainage before you begin to build. The drainage properties of the growing medium you intend to use must also be kept in mind. As I mentioned earlier, perlite is a bit too light, but drains quickly. On the other hand, vermiculite has a tendency to become impacted after repeated immersions, doesn't flush (see page 36) as well as other materials and should be changed after every crop to ensure proper use. (As well, the vermiculite you use should have as neutral a pH as possible [see Chapter 4] and no toxic amounts of boron or fluorine. If your nursery doesn't know the pH and mineral properties of its vermiculite, contact the manufacturer.) Haydite has excellent drainage properties. You must also determine whether you will be using a growing medium over a drainage medium, such as broken tiles over vermiculite, when devising your building plan. In some instances you may feel that your plants do not have sufficient nutrient solution available immediately after draining or between feedings. If this is the case, try putting a one to two inch layer of vermiculite down first with the rock or gravel on top. The vermiculite will hold sufficient moisture for the roots to grow into. BUILDING YOUR OWN SYSTEM The following illustrations are of some fairly simple hydroponic systems. 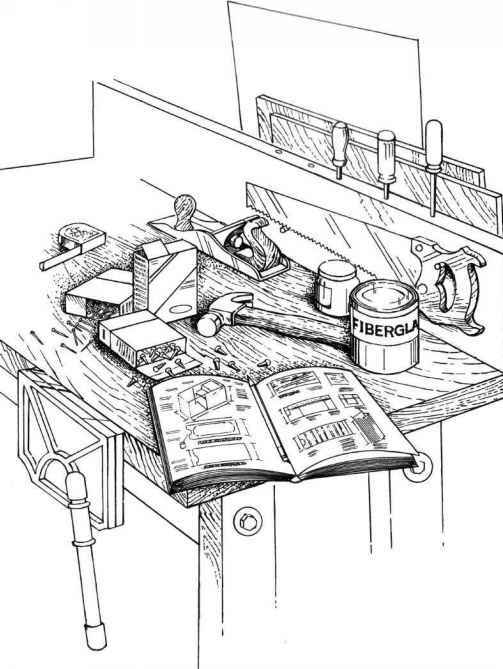 Something to keep in mind when building your own system: always obtain all the parts and materials before starting. Otherwise you might find that you have drilled the drainage hole a certain diameter and that you can't find the right size plug to fit it. For such things as pumps, timers and tubing, as well as other materials connected with hydroponics, consult the Resource List at the back of this book. Figure 2 is probably the simplest hydroponic system you can make. 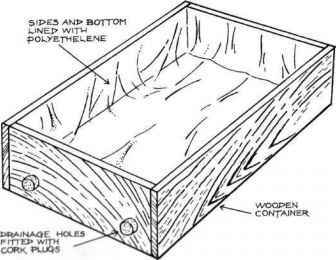 Using 3/4 inch plywood, make a box 7 inches deep, 16 inches wide and 24 inches long (all outside dimensions). Fasten the box with wood screws, allowing for the fact that the contents will be heavy. Drill two 1/2 inch holes on one end wall 1/2 inch from the inside bottom. Line the inside of the box with polyethelene or fibreglass and fit two removable plugs. On the opposite end from the drainage plugs, a 1 inch strip of plywood can be nailed to the bottom. This will sit the tank on an angle and ensure adequate drainage. This same system can be made using a plastic dishpan or any other waterproof container. It is essential, however, that any material you use for a hydroponic tank is inert, so that no chemical reaction is passed on into your food chain. For this system, use a 1 inch deep drainage bed of large pieces of broken pottery or rocks that are approximately 3/4 of an inch in size. The size is important to ensure proper drainage and so that the drain holes don't get plugged with the smaller growing medium. Figure 2. A wooden txjx lined iuirh polyethelene is ¡he .simplest hwdrupojuc system to build. Figure 3 is a manually operated system and is only slightly more automated than that shown in Figure 2. A pail with a hose attached and sealed at the joints is connected to the growing bed. 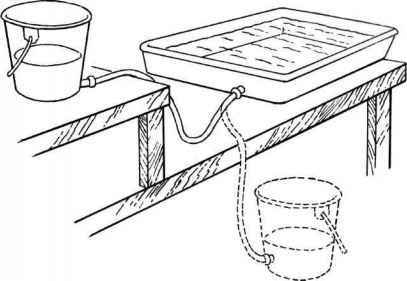 Raise the pail above the tank to allow a gravity feed of the nutrient solution into the bed. After a half-hour, set the pail on the floor so gravity will drain the solution back into it. The growing bed must be on a table or shelf to allow you to move the pail the proper distance above and below the tank. Be sure that the size of the pail is adequate to flood the system. Figure 3. This manually operated system uses a pail arul a tank. Figure 4 is one answer for the many people who ask what to do with an old aquarium. The two main ingredients to make this kind of system function well are a good strong net and a very light growing medium. Burlap and perlite would be a good combination. The illustration is self-explanatory, but a few suggestions are in order. When starting seeds or seedlings, the water should barely touch the seed bed. As the roots develop and penetrate the screen into the water, gradually reduce the water level. Roots like air and dislike light, so use your old aquarium pump to aerate the water and cover the outside of the tank with dark material to keep out the light. Make the cover removable, so you can keep a close eye on everything. Figure 4. An unused aquarium can be turned into a hydroponic system. The complete plans in Figure 5 are meant for the serious enthusiast who wants to build a system from the ground up. While the plans are somewhat involved, the unit is not that difficult to make and will last for many years. If the nutrient solution is removed, the system can be carried outdoors in the spring and back inside in the autumn. Figure 5. Complete plans for the serious enthusiast. City Green products are protected by patents and design patents granted and pending throughout the world. This unit and its design may not be used for commercial use. © City Green Hydroponics Inc.
2-1/2 yards of fibreglass cloth "panelling"
5 yards offibreglass cloth "joining"
It is easier to use 1 by 3 for the crosspieces than plywood. Simply rip a piece of 1 by 3 for the 1/2 inch strip as well as the retention strips. Look in the Yellow Pages under "Plastics—Vacuum Forming." The chances are that you will be able to buy a piece of plastic .60 thick to use for the separator plate and the funnel segment. Glue all joints before screwing together. Use 5-3/4 inch centres on the crosspieces (i.e., the centre of one hole to the centre of the next is 5-3/4 inches). You will have a much narrower section at the opposite end to the pump well, but there is more growing medium at that end. Apply three coats of fibreglass resin to the interior. After making and fibreglassing the tank, fill it with water to check for leaks. The volume capacity of the growing bed is 2-1/2 cubic feet. Be sure the unit is level. If you see roots in the irrigation tubes or drain holes in the funnel segment, either remove them or cut them out. We have found that fibreglass cloth panelling, except for comers and joints, is unnecessary for quality. A lot of time is required to use the cloth and does not provide significant benefits. The NK1 pump mentioned in the materials list features a highly corrosion resistant motor housing made of metal and glass-filled polymer which aids in heat dissipation. The pump is designed to be used in mild acids, alkalies and hard water. The NK1 pumps 171 Imperial or 205 U.S. gallons per hour with a one foot head. These pumps must be submerged to operate. The fact is that the size of pump you use and where you place your system will have a bearing on irrigation and moisture retention in the growing bed. For these reasons, you will have to keep a close eye on the operation of your system until you can establish precise requirements. If your unit is outdoors in the sun, it will have a much higher evaporation rate on the surface of the growing bed than either indoors or in the shade. In this situation, you may find it necessary to keep your pump on all the time. On the other hand, if you find that the flow of nutrient is too fast (i.e., it floods the unit too much), you can pinch off the header hose a bit with a clamp. If the unit is made to plan, there is sufficient drainage at all times that the pump could be left on during the period your lights are on or, in the case of the outdoors, daylight hours. This would remove the need for a timer for the pump. Simply turn on the pump and lights (indoors) when you get up in the morning and shut them off before you go to bed. If your lifestyle does not permit you to be relatively consistent in this routine, or if you are away frequently for a day or two at a time, then a grounded timer such as the Intermatic EB41 can be purchased along with a 3-way plug, which would accommodate both the pump and lights. Try using a 2 inch deep bed of coarse vermiculite sandwiched between 2 layers each 1-1/2 to 2 inches of stones or gravel for your growing bed. This will maintain higher water retention nearer the roots and make the total cost of the growing medium less expensive. If you are pumping once a day, you should do it during the warmest part of the day, usually afternoon, the period of greatest plant transpiration. This will help overcome the problem of wilting. If you are pumping twice a day, then maintain this first period and add an early morning feeding. For three times a day, add an early evening period. With an automatic system, it is simple to use a grounded timer (safer than an ungrounded one) to regulate these feedings. If your system is manual, and no one is available after mid-day, then it is better to feed in the morning than at night. Required pumping intervals depend on a number of factors, such as what you are growing; plant size; water retention, or lack of it, in the growing or drainage medium; and the climate, including temperature and humidity. Tomatoes will require a far greater amount of water than lettuce, for example, and porous stones, more water than vermiculite or perlite. Hot, dry conditions cause more rapid evaporation than a cool and humid atmosphere. Your plants will use greater amounts of water than nutrient, assuming you are using a correct solution, because the nutrient does not evaporate with the water. Therefore, the water requirements of your plants and your aggregate are the prime considerations in calculating pumping intervals. One to six times per day would not be unreasonable. The most common approach to the duration of irrigation is one-half hour for a flood system. You should try to drain the system as quickly as possible after this time to prevent possible shock to the roots. If the rate is too slow, the roots will be immersed for too long and there will be a corresponding lack of aeration. If you have a flood system outdoors in hot weather with plenty of tomatoes or similar plants, the plants will require a lot of water, and six feedings of one hour duration would not be unreasonable. The depth of the nutrient solution depends to a certain extent on the kinds of plants you are growing and their sizes. Both the drip from above and the flood and drain methods give rise to algae growth if the surface is constantly moistened, but bringing the solution level almost to the top is unavoidable when seeds and seedlings are present. In fact, you must be careful to raise the level high enough to moisten the seeds', but not so high that they are covered completely, only to be washed deeply into the aggregate during drainage. If algae starts to grow on the surface of your growing bed, you can eliminate it by providing more aeration to the top one inch of the bed, by making the surface less moist, or by removing the light source (if possible) for a few days. I do not recommend the use of algaecides such as the ones used in fish aquariums and ponds. Permanganese and other similar substances are poisonous and can be transferred into your food chain. To give some idea of the differences between homemade and commercially available systems, the following drawings show the City Green constant flow, manufactured hydroponic unit. The use of such a system, particularly as a novice, will assist you in learning about hydroponics and in getting early results. Although a commercially-made system, such as the City Green unit, may not be available in your area, it would take only a small amount of ingenuity for you to copy the design for personal use but not for commercial sales. Figure 6. The "City Green" home system before the drainage and growing mediums have been added. Figures 6, 7 and 8 show the "City Green" home system. It incorporates a 3 inch deep growing tray set into the nutrient reservoir tank, both made of strong, lightweight, vacuum-formed plastic. Each tank should be approximately 24 inches by 16 inches and 9 inches deep. With the 3 inch growing tray, you are left with a 6 inch deep water reservoir. be incapable of pushing the water to the end of the irrigation hoses. You can, however, by using another windshield wiper fitting operate a maximum of two tanks from one aeration pump. Should you use two tanks and one pump, do not allow the water levels in the two tanks to vary more than an inch or two or the tank with the greater amount of water will fail to pump. 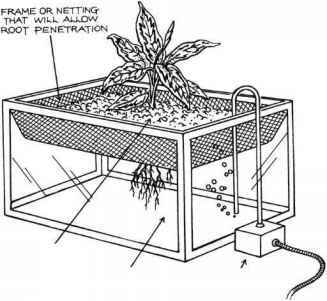 Instead of a 3 inch deep growing tray, you could follow a similar method as the large system in Figure 5. That is, a 1/2 inch plywood strip around the inside perimeter of the tank that allows a 1/8 inch sheet of plastic or arborite to be used as a separate plate. Be sure to use about three crosspieces for support of the growing medium. Figure 7. The "CAty Green" home system before the finallayer of growing medium has been placed over the irrigation hoses. A 1 inch thick layer of coarse vermiculite is placed between two 1 inch layers of growing medium (expanded oil shale). The perforated plastic tubes are buried to about the bottom of the top layer of growing medium. This holds them in place. If the tubes were on the surface, it would be too moist and an algae build-up would result. perforated irrigation tubes are attached. The air travelling through the air hose and entering the water hose acts with a venturi effect to lift the nutrient solution from the bottom of the tank up into the growing bed. The growing tray has several 1/8 inch holes drilled in it to allow drainage. Figure 8. Connecting the irrigation hoses, water hose and air hose. 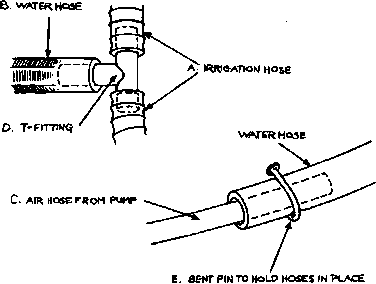 Irrigation hoses 3/8 inches outside diameter, 3 inches apart; use an electric drill and drill through only one wall of the tube, not both walls. Be sure the holes are not burred on the inside or the water will not flow smoothly. Water hose 14 inches long, 5/8 inches outside diameter. Air hose 8 feet long, 1/8 inch diameter to fit onto the aquarium pump, inserted approximately 6 inches into the water hose. Windshield wiper t-fitting. Cut a 1 inch piece of the irrigation hose to insert into the water hose snugly. This will then fit onto the t-fitting at D.
A 1 -1/2 inch pin forced through the two hoses and bent back to hold them in place. Figure JO. Several units placed one on top of another. They should be placed on racks. Likely the simplest of all hydroponic systems developed in recent years is the N.F.T or Nutrient Film Technique. We have our British friends to thank for the idea of foregoing the use of a growing medium. 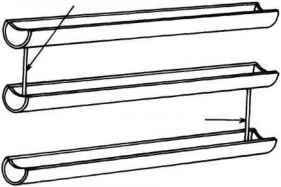 By taking any length of 5 or 6 inch PVC tubing and plugging the ends, the same length of plastic film or sheet is set into the tube into which seedlings are placed. The film is then folded up above the root system and stapled. (See Figure 9) This prevents light from obstructing the growth, development and function of the root system. Remember, the root system must not be exposed to continuous direct light. Build a rack to support as many tubes as you have room for. For your ideas look at how a boat-trailer is designed to hold a round-bottomed boat. If plants become too weak or spindly to support themselves, i.e., tomatoes, peppers, etc., the tops of the plants can be lightly tied with string and fastened above to abeam, the unit above it, or the ceiling. This will provide the support that is normally available from the soil. Seedlings, started in a combination of half fine vermiculite and half peat moss, show an excellent rate of growth. When the seedlings have sufficiently developed, they can be placed, growing medium and all, right into the trough inside the plastic film. The N.F.T. system has been used throughout the world in commercial operations. The only difference separating the domestic from the commercial method is in the watering application. Where the commercial systems use computers to feed and water the plants, you will use a gravity-feed system, a small pump, or feed and water by hand. If you water by hand, put about one inch of nutrient solution in the tray for one-half hour and then drain. You can keep reusing the solution for a week. Watch for wilting plants and govern the number of feedings per day accordingly. The plants will likely require three or four feedings a day. Be sure the tray is level. If you build several trays and stack them, you would use a nutrient reservoir with a small submersible pump that sends water to the topmost unit. By inclining each tray about 4 degrees, the solution can gravity-feed back to the nutrient tank. A timer could pump the solution three or four times a day for one-hour duration each, freeing you to go on holidays for a couple of weeks. 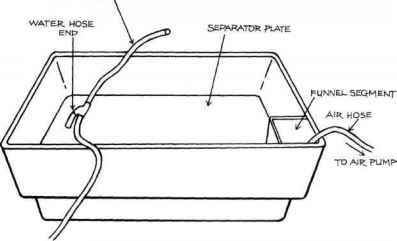 The plastic tubing cemented in the bottom of each tray (Figure 10) allows the free-flow of nutrient solution. How to make Homemade Rainwater harvesting system? How to make aquarium air lift water pump? How to make a homemade hydroponic tank?